It just so happens that I picked the most trying week to show my bare face on the blog for the sake of a foundation review. And what would a true foundation review be without testing against a spotted face? 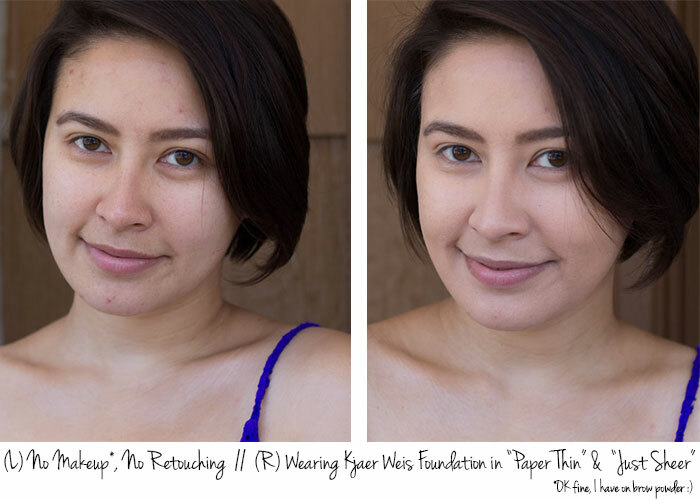 Kjaer Weis Foundation was up to the test. Do you think it passed based on the before and after below? 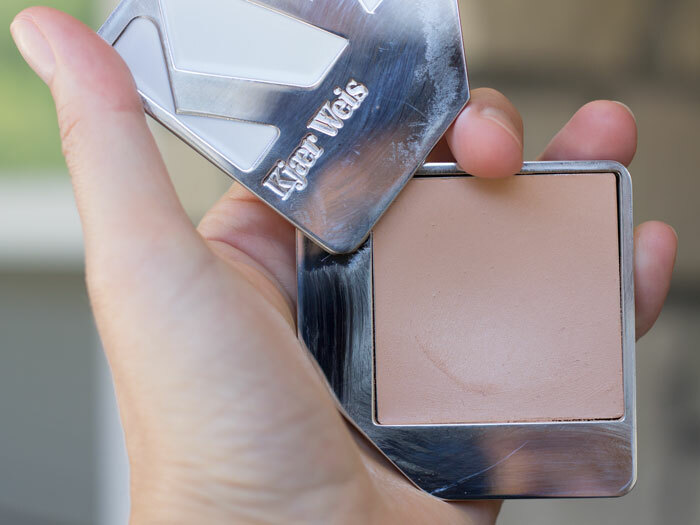 Kjaer Weis’s velvety cream foundation has been in my arsenal for a few months, and it’s one I reach for when I want a polished look and have time to indulge in meticulous blending. The lightweight, buildable formula gets its grip thanks to a mix of sweet almond oil, coconut oil, carnauba wax and corn starch. Applied in thin layers, Kjaer Weis’ foundation can offer a sheer, evened-out look or high-impact, maximum coverage that still looks and feels light. Wanna guess which route I went in the picture above? Though hopefully you can’t tell, I applied a couple of thin layers, concentrating additional coverage on my chin and forehead where active breakouts where bringing me down. I also added a bit more under my eyes (always so prone to dark circles and puffiness!) and around my nostrils. I blended out “Paper Thin” all over my face; it’s not quite the perfect match, as its cool, pink undertones look a little funny on my skin, but with a layer of “Just Sheer” on top (which has the correct olive undertones but is a tad too dark for my skin), I created a somewhat-perfect mixture for my complexion. Applied with a BeautyBlender knockoff, Kjaer Weis’ foundation instantly melts into (properly prepped — think oiled-up and misted) skin. I cannot stress enough that you must massage and blend this foundation in to ensure no clumps gather on your face. Take your time! The results are fabulous. Remember, build, build, build. You can always add more, but it’s a bit more difficult to remove! Once you get a feel for the texture and how to work it into your skin, Kjaer Weis’ foundation can easily become your all-in-one foundation and concealer for light and full coverage days. The only drawback, for some, is that it contains coconut oil, which disagrees with some people’s skin (not mine!). Another thing to consider is the price. At $68, it’s on the luxury side, but it’s well worth it. The heavyweight, glamorous (and refillable!) packaging makes it a standout on your beauty counter. Foundation refills cost $40, so once you’ve settled on the color (or colors) that are right for you, the repurchase isn’t as heavy on the wallet. I’m hoping that Kirsten, the mastermind makeup artist behind Kjaer Weis, releases new color options soon. While I’m smitten with the formula, look and feel of the foundation, I long for a closer match to my half-Asian, half-Scottish skin. Until then, my blend will do! What do you look for in a natural foundation? Have you tried Kjaer Weis Foundation? What were your thoughts? Tell me in the comments section!